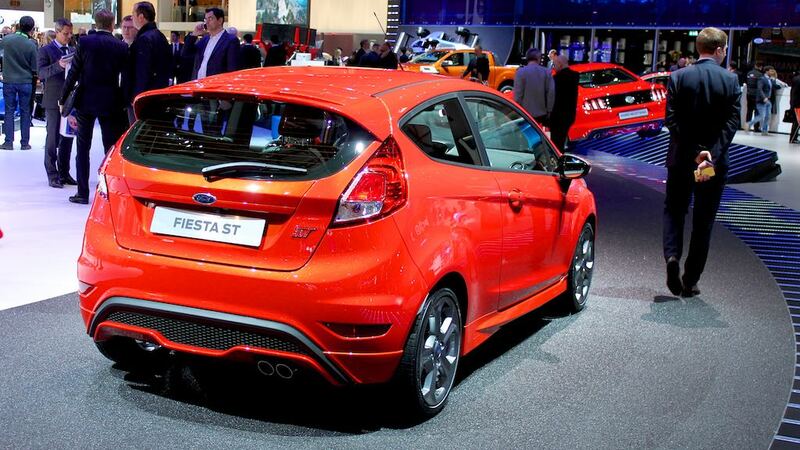 The fastest selling used car in Britain in 2015 was the Ford Fiesta. Second-hand Vauxhall Insignia and Toyota Prius cars were also easy to sell in the UK. The top ten car models selling the fastest as used cars in Britain all sold on average in just less than a calendar month. The fastest selling models where mostly nearly new or three years old and thus released back onto the market by leasing companies and similar with private buyers keen to pick up cars once the most severe depreciation had occurred. Auto Trader claims nearly two-thirds of all second hand cars sold in the UK are advertised on its website. The almost-new 2015 Ford Fiesta was the easiest car to sell in 2015 in Britain with the small Ford, Britain’s most popular new car for the past seven years, selling quickly in most parts of the UK. On average, the 2015 Fiesta sold within 29 days. More surprisingly than the Ford Fiesta taking the top slot were the 2012 Vauxhall Insignia Hatchback in second place and the 2012 Toyota Prius in third. Both cars also sold nationally on average in 29 days. Both models are helped by lower prices as three-year-old models are often returned from leases and company sales but the Insignia has not been popular new for several years. It was the cheapest car while the Prius was the third most-expensive car on the top-ten list. The Prius became the first alternative fuel car in the top-ten list. The Prius was also the quickest car to sell in the South East – 28 days. 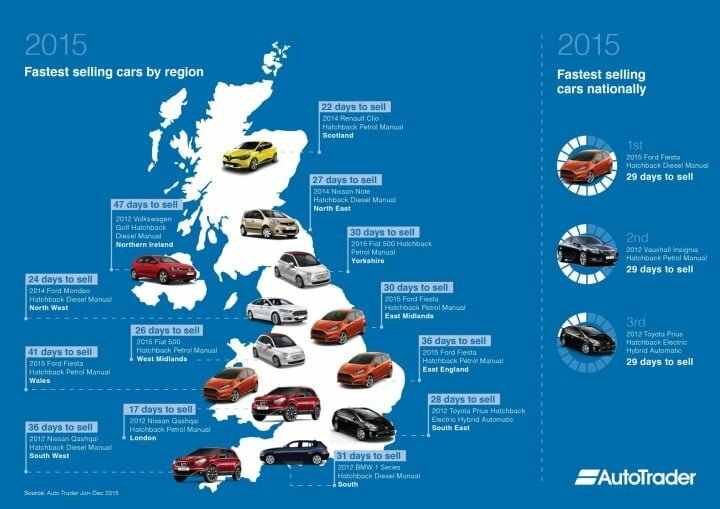 Most of the other cars on the top-ten list of fastest selling used cars in the UK in 2015 were sold in 30 days. The 2015 Kia Sportage SUV was the quickest used SUV to sell but as the model is new, also pricy at over £19,0000 on average. The 2012 Mercedes Benz B-Class was the fifth fastest car to sell in Britain – expensive new, private buyers seem eager to pick up premium quality once the worst depreciation had already occurred. The 2012 Nissan Qashqai was sixth nationwide. The Qashqai has been a very popular car in Britain in recent years and was the fastest car to sell in London – it took only 17 days to sell one in the British capital. Surprisingly, the petrol version sold quicker than the more fuel-efficient diesel that is often more popular in SUVs. The Citroen Grand C4 Picasso MPV and Vauxhall Mokka were both newer 2014 models while the Volkswagen Touran and BMW X3 were both the older 2012 models. No 2013 models were on the top-ten list, reflecting in part that these cars are mostly due to be released onto the used car market in larger numbers only in 2016. Cars older than three years were also harder to sell. The 2012 BMW X3 was at just over £24,000 the most-expensive car on the list. The Ford Fiesta was the easiest used car to sell in many regions of the UK but in the North East, Nissans remained very popular with the Note taking first and third places, the Juke fourth and the Qashqai fifth. The Qashqai was the fastest car to sell in London – on average only 17 days – and in the South West where the diesel Qashqai was the fastest to sell but taking a longer 36 days. Where the fastest car to sell in London took only 17 days, trade was a bit more relaxed with the Fiesta taking 41 days in Wales and the VW Golf 47 days in Northern Ireland.